Your most memorable lesson of the year? As the end of 2017 draws near, it offers educators an ideal opportunity to reflect on the last 12 months. Below educators share their most memorable lessons, which engaged and equally challenged their students. 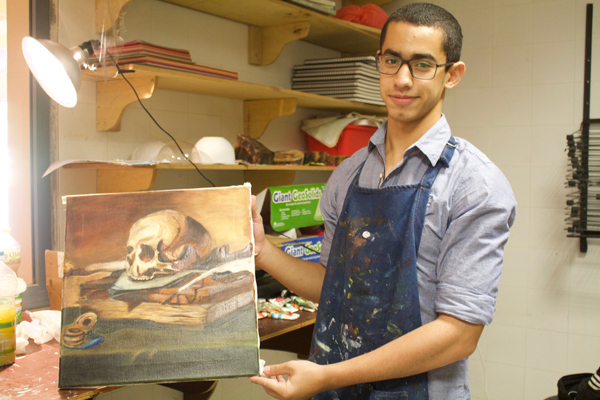 “Teaching students to paint in oil has been the most rewarding lesson that I have taught in a long time. “While planning this unit, I was worried as oil painting is the opposite experience when compared with immediate gratification. How would students who were born in this millennium be able to take the time to learn to wait for oil to dry, glaze subtle layers over each other and mix colours in a non-intuitive process? I have been working in oil for almost 20 years and still feel that I am just beginning to be able to handle the material. How could I expect students to take on this slow, and often tedious, method of image making? “But, I love painting in oil. Working in the medium connects you to 500 years of art history directly. It is deceptively simple and one of the most complex processes at the same time. I am transported when I paint, and I hoped that one or two of my students might feel the same way. “So, I decided to take the plunge and go all in. I did not cut any corners. Rather than hating the slow and messy delayed process of oil and the decidedly non 21st century skill set of oil painting; all students thoroughly enjoyed it. Students learned patience and organization. 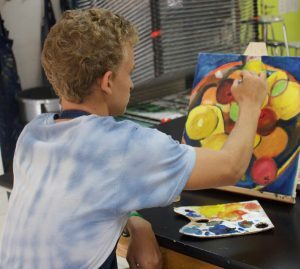 “Oil painting has been one of the most successful lessons I have taught in my 16 years as an educator. “My takeaway is that students actually want to immerse themselves in non-technological experiences. Slow deliberate processes develop deep thinking. My only modification for next year will be that I’ll have the students grind their own paint”. “Back in August, I asked my Diploma Programme (DP) Year 1 students to become inspired by the emotions different songs elicited and display their feelings on walls of an empty classroom through art. While I played different songs—of different genres and times—they were painting the plastic covered walls and floor. “They had a great time and it was needed—students can feel stressed at different moments during the DP. Students have an initial hard time making differences between what knowledge acquisition and knowledge production are. This class led us to a discussion about the differences between acquiring and producing knowledge in the arts. “Most of them realized that emotions are usually involved in artistic knowledge production—that different artistic languages, and different areas, can interact to produce knowledge, and that personal knowledge plays an important role in knowledge production in this area. They also learned that knowledge can be produced collectively. “Ever since this lesson I’ve been asking myself: ‘How do I become a mediator of knowledge production experiences for my students?’, ‘How do I scaffold my students into understanding theory of knowledge (TOK) concepts, using what they know in terms of knowledge acquisition and production in the different disciplines they study?’, And ‘how can I optimize collaboration with other DP teachers in doing this?’ I am still working very hard on this, but it is definitely a most valuable lesson that will improve the quality of my work in the next school year”. 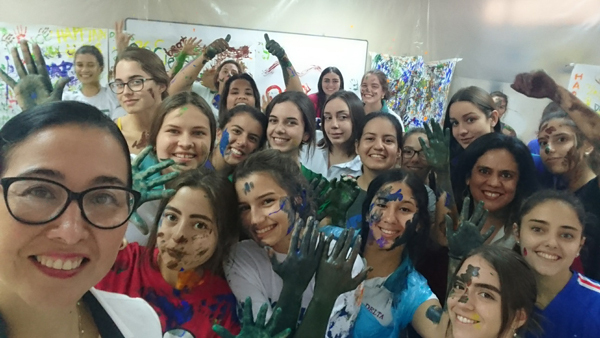 “In our Middle Years Programme (MYP) science/language and literature interdisciplinary unit: Infectious Ideas students learned how the spread of disease affects everyone. They discovered the importance of human behaviour and the consequences of our actions. 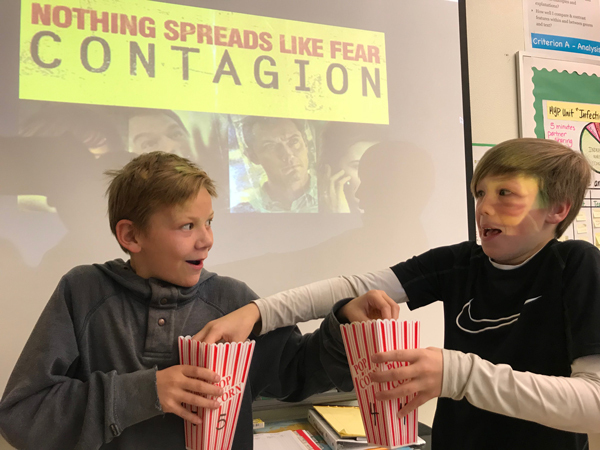 “Language and literature students watched the film Contagion—which documents the spread of a virus, which becomes a global pandemic—and analysed audience imperatives, using different scene clips . “Science classes did a ‘Zombie Outbreak’ analysis—they traced the evidence and tried to find out where the disease originated and how it was transmitted. They used simulations and real-world studies of infectious diseases to inquire about how viruses affect a population. “It is my hope that we will try this interdisciplinary again with next year’s students”. 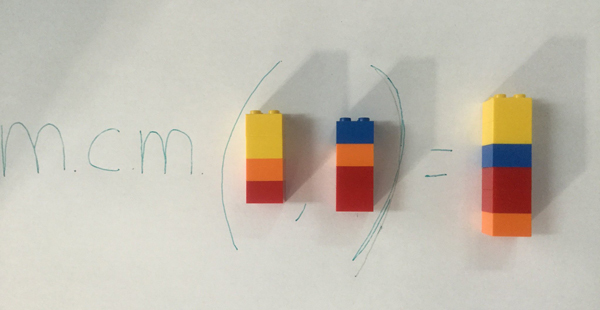 “My most memorable lesson this year was when I taught the principles of greatest common divisor (GCD) and least common multiple (LCM) using Lego bricks. “The day before our lesson, students learned how to calculate LCM and GCD, using the factorizations of the numbers. This was completely new to them—they already knew how to factorize, but they learned how to find the LCM by computing multiples and choosing the least common one, and the GCD by computing divisors and finding the greatest common one. “On the day of the lesson, students got excited when they saw me entering the class with some Lego bricks in my hands. The trick was to think of each colour as a prime factor and that piling bricks is like multiplying them. “I’ll always remember how their faces changed when they got it. 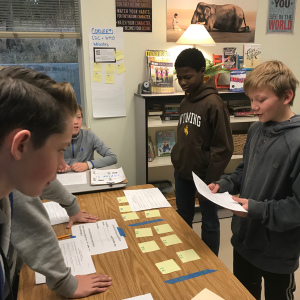 Their homework showed that this method worked—students had a deeper understanding. “We are definitely including this lesson in our curriculum, and we plan on delivering this method every year”.